Manx Radio are once again proud to be working with the Manx Gilbert and Sullivan Society for their fabulous show coming to the Gaiety Theatre in October! 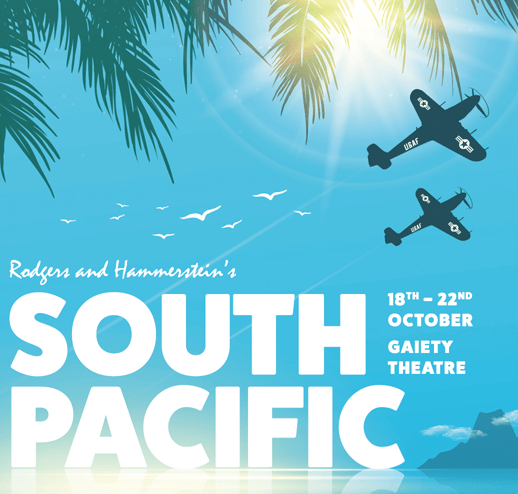 For an enchanted evening, come and see Rodgers & Hammerstein’s popular musical, South Pacific from October 18th to 22nd. Set on an island in the South Pacific during World War II, this popular musical contains some of the best loved songs by Rodgers & Hammerstein including “Some Enchanted Evening”, “Younger Than Springtime”, “This Nearly Was Mine” and “There Is Nothin’ Like a Dame”. For tickets, phone 600555 or visit villagaiety.com. South Pacific is sponsored by Pokerstars, and is supported by the Isle of Man Arts Council, the Isle of Man Steam Packet Company and in association with Manx Radio.